In the SIL house, Tuesdays are always Taco Tuesdays (and if it's not tacos on the table, we call it Mexicano Martes - also known as Mexican Tuesday - because we have to have mexican food at least once a week) - but that means that every Wednesday I usually have a bunch of leftover black beans laying around. This recipe was created one Wednesday when I had leftover black beans sitting in the fridge but I didn't just want brownies. 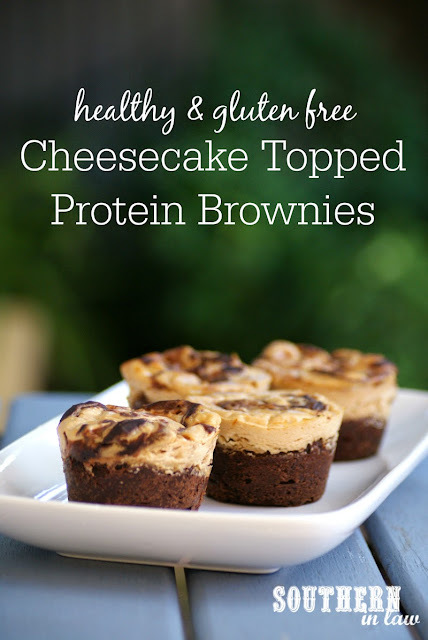 We'd just finished up a batch of protein muffins and I wanted to make a protein filled treat butttttttttt I also needed to use up those black beans and I really wanted cheesecake. So what does one do when faced with that situation? Combine all of the above, of course! And so this random concoction of deliciousness was born! Combining brownies and cheesecake in a high protein recipe that also uses up those leftover black beans, this is a recipe that's deceptively simple to make and deceptively healthy. But if the idea of using black beans skeeves you out, don't worry! 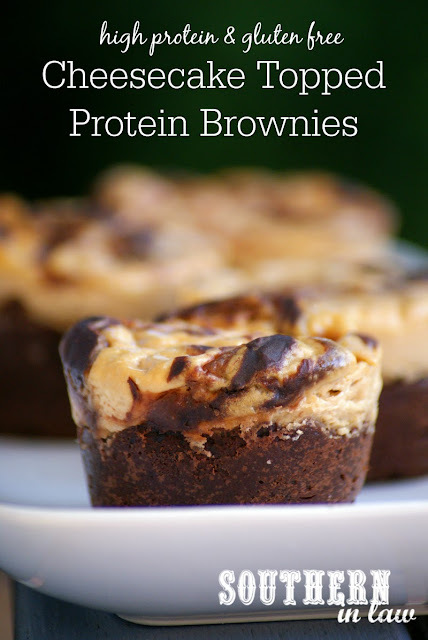 I've also included a beanless version that can be whipped up in minutes and tastes just as delicious - and if you're not a fan of protein powder there's a protein powderless option as well. Why the different options? Because I seriously can't have you miss out on these babies. 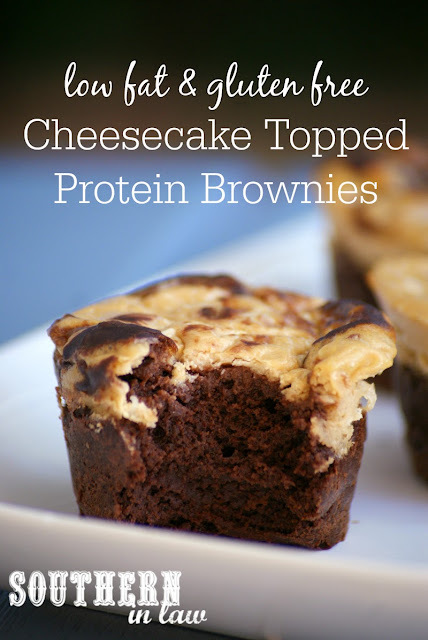 With a moist and fudgy brownie base and sweet, fluffy cheesecake topping, this is a recipe I'm sure you too will be making week after week. Other options: Use our Healthy Flourless Protein Brownie Recipe for a beanless version or our Healthy Black Bean Brownie Recipe for a protein powder free option. Grease and/or line a muffin tin and set aside. In a food processor/blender/cuisine companion, puree your beans until all of the beans are broken up. Add in your peanut butter, vanilla, milk, egg, egg white and applesauce, processing until your mixture is smooth and combined, scraping down the sides as needed. Add in your protein powder, cocoa powder and sugar and process until combined, scraping down the sides as needed. Pour your brownie batter into the bottom of your prepared muffin tin, filling each of the tins 1/2 full to leave room for the cheesecake topping. *We used this unflavoured brown rice protein powder. If you're looking to make these grain free be sure to use a grain free protein powder, otherwise, feel free to use whatever protein powder you like. If you're using a sweetened protein powder, you may want to slightly decrease the sugar called for in the recipe. **Increase the sugar amount if you like your baked goods really sweet. Combine all of your cheesecake ingredients either by hand or in your food processor/blender/cuisine companion etc, mixing until smooth and combined. Pour your cheesecake mixture on top of your brownie batter, leaving just a tiny bit of space at the top (literally 2-4mm of room) to avoid spillage. If desired, swirl your cheesecake batter with a toothpick, bringing some of the brownie batter from the bottom up to the top for that swirled effect. 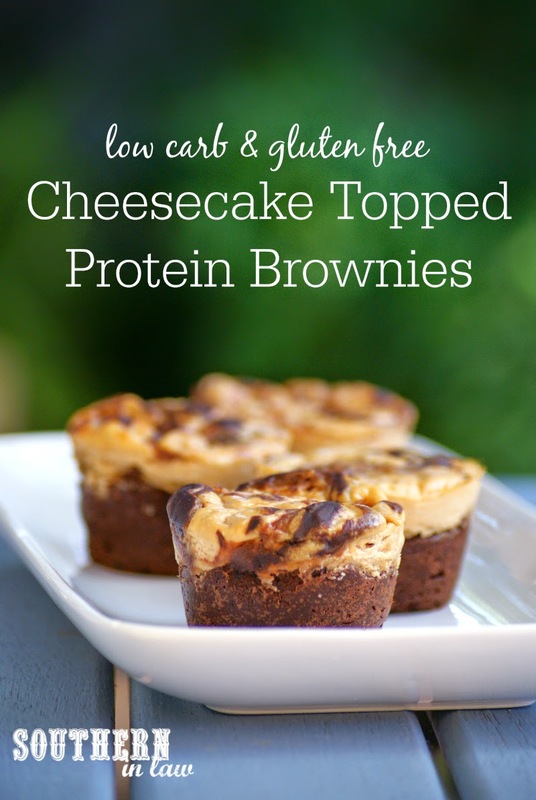 If you have any leftover cheesecake batter, feel free to pour it into another muffin tin for mini crustless protein cheesecakes! Carefully place your cheesecake brownies into your preheated oven, baking for around 25-30 minutes or until your cheesecake is set and lightly golden. Allow to cool for 15-20 minutes before placing in the fridge to chill completely. These are best served chilled and will keep in the fridge for up to 3-4 days in an airtight container. But tell me, do you have any set "food days" at your house? And what's your favourite dessert/sweet food at the moment? Cut up banana slices to top it off. Yummmmm. And I don't feel bad or bloated after having them - whereas I know I would if I had an ice cream or a chocolate bar or something else I shouldn't have! Yummo! That sounds like the perfect combination - I'm loving honey at the moment and bananas are always a fave!